A hammertoe is a deformity that usually affects one or more of the toes. 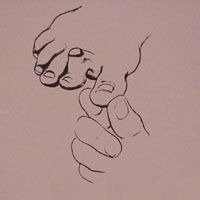 The toe curls or buckles under, which in turn causes the toe to contract or shorten in length. These deformities are usually either flexible or rigid and they also may involve a bone spur. A corn is a build-up of thickened skin that occurs on the tops of prominent joints, and is frequently found with hammertoes. These corns may become irritated, infected or even ulcerated, with their progression. Often times, as both of these deformities progress, pain may also develop on the ball of the foot, and this could even lead to the development of a thickened area of skin or callous formation on the bottom of the foot. Hammertoes may be caused by heredity, high-arched or weakened foot musculature, or other deformities of the foot, for example, the common bunion. The bunion may cause the second toe to contract and move, and even overlap the big toe. Hammertoes and corns are sometimes treated conservatively with appropriate padding, the use of wider shoes, possibly shaving of the corn, and even the use of various injectable medications to relieve some of the inflammation. All these methods afford only temporary relief; however, surgery can correct this problem, and often this procedure can be performed on an outpatient basis, under a local anesthesia, if it is so desired. Complications with this procedure are relatively rare; however, there are, as with any surgery, associated risks and these should be understood by the patient prior to the surgical intervention. Discomfort following surgical treatment is usually mild. Generally, as soon as one day postoperatively, most patients will be able to bear some weight on their foot.